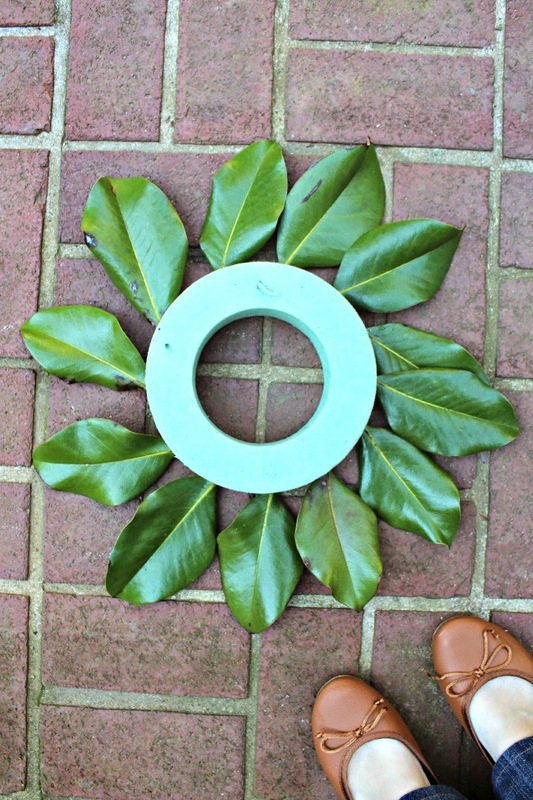 This DIY Magnolia Wreath Tutorial shares step by step instructions for how to make a Magnolia Leaf Wreath with a Dollar Tree foam wreath form. 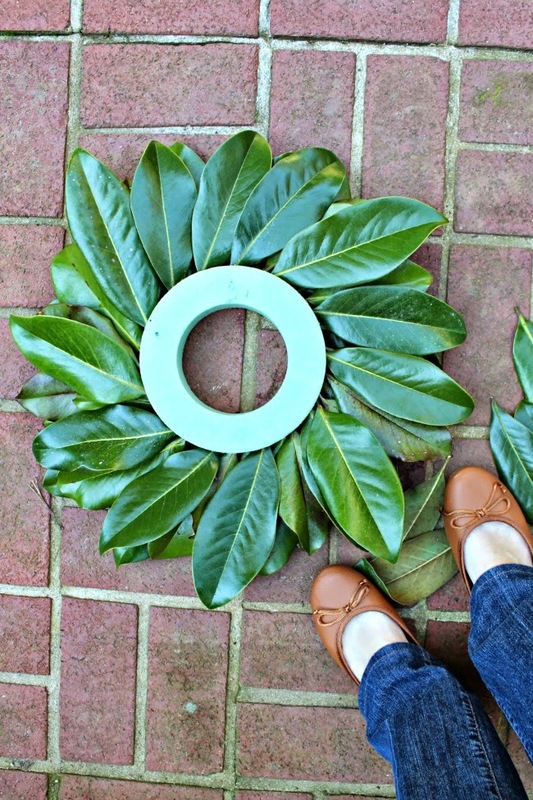 Today I am sharing a 15 Minute DIY Magnolia Leaf Wreath tutorial. Raise your hands if you LOVE the classic look of Magnolia leaves? There is just something so classic about them. And the best part is they are inexpensive and easy! Seriously, I will run out of doors to hang these wreaths on before I run out of time because they are so easy. Oh, and did I mention they were inexpensive? We have a couple Magnolia Trees in our yard. As much as I despise those dang waxy leaves in my grass, I sure do love them using them in my home! For this simple DIY Magnolia wreath, all you need is a foam wreath form, from you guessed it, apparently my favorite place these days… The Dollar Tree! *if you can’t find at the Dollar Tree, here is a similar option from Amazon. brought my 3 year old to the Dollar Tree with me. Note to self, go alone! But the good news is that same 3 year old helped me pick the leaves, hey, he’s gotta earn his keep!OK, are you ready for this super intense tutorial? Try to leave the stem as long as possible because that is what you use to insert the leaves into the foam. Insert those leaves into the foam wreath form. You just start sticking the leaves right into the foam. The hardest part is collecting the leaves! Here is what it looked like after inserting one row of leaves. Now, you may be surprised at how many of your leaves you already used! It looked like a lot when you had them stacked, but trust me. You will need more than you think!Here it is with the second row of leaves. Just keep adding leaves until it is full. You are done when it feels finished. There is no science to it. I did end up sticking a few leaves on the inside to fill it in, but only a few did the trick. If all of the green foam is covered, consider it done! I am loving this simple wreath! And for a fun holiday Metallic and Blue version click here for the full tutorial! Thanks so much for stopping by the blog today, I do hope you feel inspired. If you’re new here today, I’d love for you to join my email list! You’ll receive a notification straight to your inbox any time there’s a new post on Southern State of Mind, just enter your address below. Great idea! There is a magnolia tree in the lot next to us that drops most of its leaves on our property. I guess this is the only good use they have to me. Otherwise, I hate them and wouldnt be sad to see that tree go. Our grass in that area is dead and the leaves STINK!! I love Magnolia's and I use them a lot, but never like this, I love your wreath and so simple. I'm going to make one today. Thank you for sharing this simple, beautiful wreath. I actually have a question; how long will the magnolia wreath look good? I'm concerned the leaves will turn brown and look awful. I love magnolia trees, wish their blooms would last longer. I'm so anxious to make your wreath, it's beautiful and your instructions well written. How long will it stay nice and green? So pretty, love it! Love this. I have a Magnolia tree that needs to be pruned up, so this is perfect! Thanks for this great tutorial! 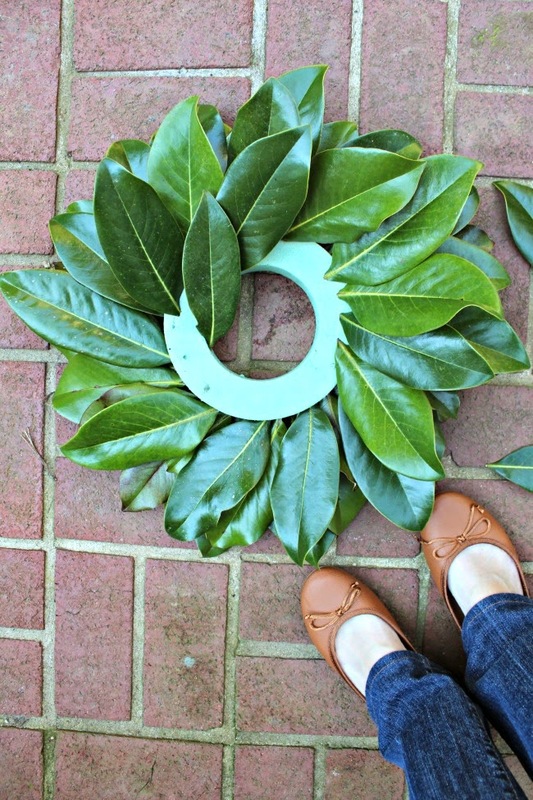 I thought it was a lot harder to make a wreath from the magnolia leaves. Do the leaves fall out as they dry? Have you ever used glue on the stem before you stick it in the wreath form? Hahaha….here I am making it harder than it actually is. Really good question! Did anyone ever answer? If I get brave enough, I'm going to "borrow" some magnolia leaves from the neighborhood trees. So sorry now that we had to remove ours a few years ago before I learned how useful the leaves are. This is just beautiful! I love how easy it looks to do! I may need to start walking around looking in my neighbor's yards for fallen leaves 😉 I'd love for you to share this at my Creative Ways Link Party this week. It goes live on Wednesday at 8pm central. Hope to see you there! I adore this wreath! I have seen it 'floating' around this week on different linky parties, but just now getting around to your blog. I ALWAYS make fresh boxwood wreaths for Christmas. I tell my husband when he's clipping hedges in the fall NOT to clip our boxwood, I need them come Christmastime! I am so making this magnolia wreath in this year!! It's beautiful and elegant. 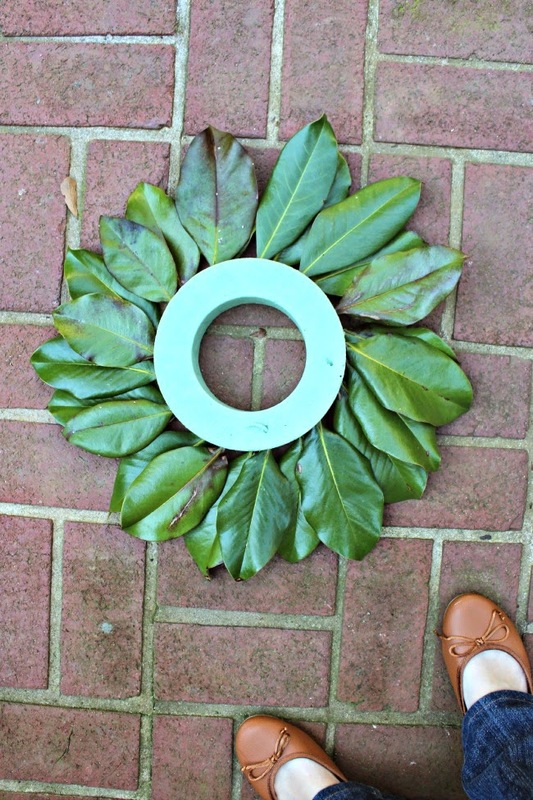 Thanks for sharing this wonderfully creative and inexpensive homemade wreath. Shared on my SM – Coming to you from the weekend retreat! How long will the magnolia leaves stay green, I wonder? This is adorable, and I'm SO jealous b/c we DON'T have a magnolia. We may buy one though just to have those awesome flowers and leaves available!!! I'm in love with this! One of our neighbors has a magnolia tree and the leaves drop all over the sidewalk…that's common property right?! I may just have to clean up their leaves for them. 😉 haha! The magnolia is a favorite tree for me! I have made magnolia wreaths for years. I learned through my Master Gardeners’ club to spray the leaf with regular floor wax. I just pour some wax into a spray bottle and hang the wreath outdoors while spraying it. Let it drip dry and then hang it either indoors or outdoors. The wreath will look good for a few months. I love this and such a great tutorial! Wow, fabulous! I love magnolia trees, and your wreath is outstanding beautiful. I’ve seen them in the stores, and wonder have they lost their mind? Who can afford those prices? I have not seem any leaves at the $ tree, but I will keep looking. You truly did a great job. If you can, cut the magnolia leaves from the tree. They will stay fresher longer than those picked up after they’ve fallen. Cut stems that are about 1/4 to 1/2 inch thick with several leaves each and then trim single leaves or shorter lengths if needed. Also, polishing the leaves with a dab of olive oil on a soft cloth makes them look glossy and preserves them. Some people like to take the time and effort to dip just the tip of the leaves in gold paint. Ask your neighbor if you can cut some of their leaves. (Make a nice little arrangement for them as a thank you.) Merry Christmas ! Awesome !!! I’m definitely going to try and make one !